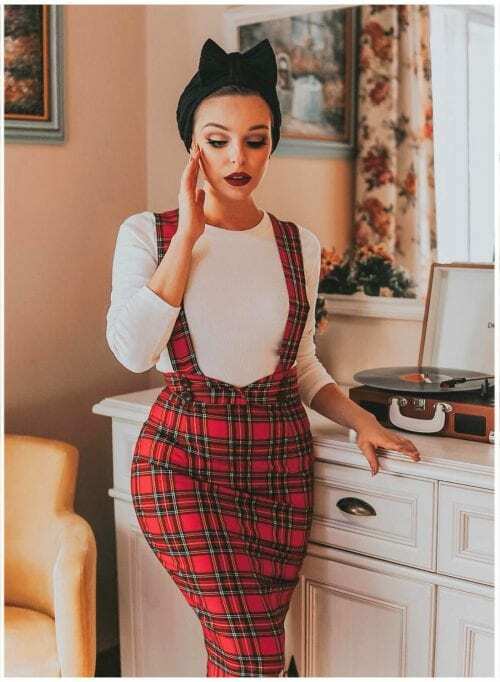 We are continually adding new retro dresses to our collection, swing dresses, full circle dresses, pencil dresses and vintage skirts in stunning vintage styles. On this page you can see the latest in our collection. We believe everyone can possess the glamour and style of a 1950s movie star, it just takes the right dress… and may we present the right dress? Love made her do it, love of a beautifully-made vintage pencil dress that is. Exquisite red satin jacquard, the perfect bodycon fit with just the right amount of stretch to make this the vintage dress for ladies who like to get into a little squeeze. The perfect pencil dress? Yes, we really mean it. 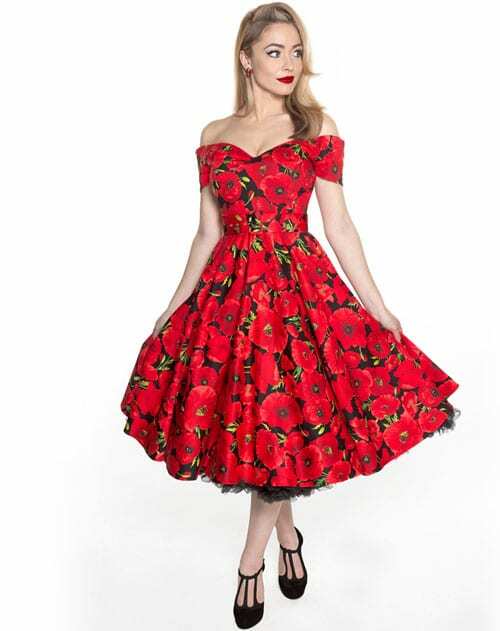 Rhonda’s Revenge is one of our most popular vintage styles, so we know you’ll love this SS19 edition in our brand new vibrant scarlet and black poppies print. Tartan is such a marvellous fabric to work with, bright vibrant and rich in history both recent and ancient. It’s a perfect match for our vintage-loving ethos, so it is no surprise to find the fabric cropping up on some of our most well loved 50s style dresses. Rhonda’s Revenge is a British Retro icon, the ultimate wiggle dress influenced by the elegance and glamour of a bygone era. This elegant version in black is the very essence of 50s sophistication, a vintage vision of loveliness perfect for the girl who loves her retro style. 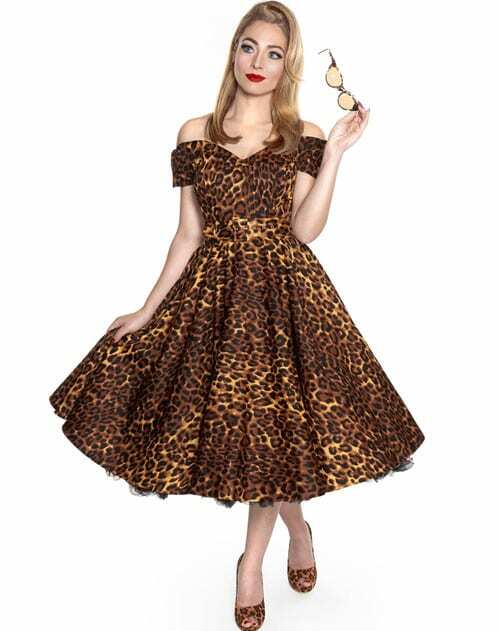 Magical and glamorous with lashings of delectable retro style, From Kitty with Love is the most elegant 50s style circle dress you ever did see! A true vintage confection that will turn any girl into a red carpet starlet, fitted to the waist and an outrageously generous amount of luxe stretch crepe in the skirt, it will flatter every figure and give the wearer the kind of 50s vintage pinup shape that turns heads. A swing dress that combines the warmth of the softest brushed cotton with classic and elegant vintage design? That’ll be our marvellous Way Out West full circle dress, a classic 50s style shirt dress design in distinctive mulberry tartan. Every 50s pinup queen needs her LBD! The perfect vintage-style little black dress that can be dressed up for full-on vintage Hollywood glamour, or dressed down for an adorable 1950s retro day dress look. We’ve been kitting you lovelies out in the best vintage inspired dresses for so long, we thought it’s about time we added a coat to our collection of fabulous retro-style clothing! Inspired by a 1950s evening coat and full of vintage glamour, ‘Wonderland’ is an exquisite garment, made with soft, warm Melton fabric and sumptuous silky satin contrast lining, it feels as luxurious as it looks. From Kitty with Love… and British Retro, of course! We want our vintage babes to stay warm and look hot and this winter, so we’ve created the most enchanting of 50s inspired swing dresses just for you. Limited edition loveliness! We’ve given the iconic 50s pencil dress a Scottish twist with some stylish Black Watch tartan details. Jaunty lapels, matching belt and covered buttons add a touch of Highland finesse to this beautiful retro-inspired wiggle dress, making it perfect for all those festive parties. Way Out West, no not the wild west, silly! Our very own British west country with a Celtic tartan full-circle dress in the most beautiful jewel colours complemented by a matching brass buckled belt. Every now and then we set aside the precision-cut pattern pieces and smart vintage tailoring to bring you something a little more relaxed and fun. The original studio designs on our vintage-inspired t-shirts are quirky and unique, perfect partners for denim and sure to bring a smile to your lips. 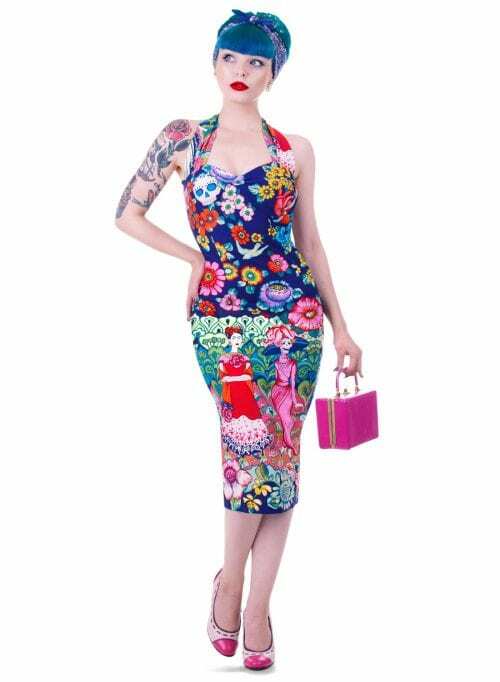 Oh my, ain’t she sweet in that adorable vintage pencil dress? The very essence of pinup style, our classic halter neck in summery white, so fresh and delightful… but covered with the decaying heads of hideous zombies! ‘Carpe Noctem!’ Oh, okay, let’s seize the day as well. 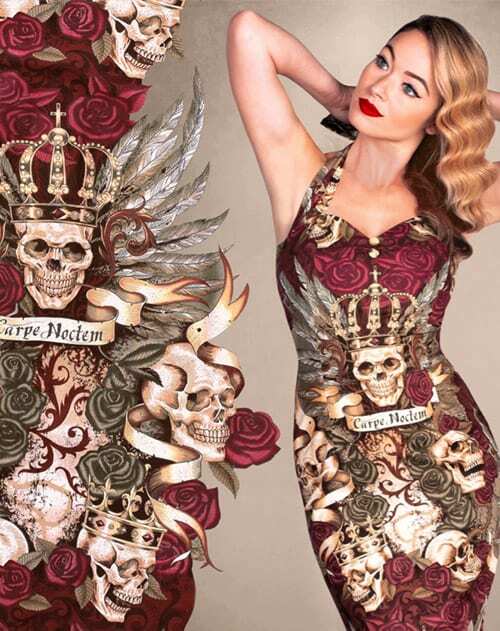 A sizzling 50s inspired halter neck dress, adored with exquisitely printed royal skulls and roses; fiendish and macabre, but in this vintage wiggle dress you’ll look just peachy! The quintessential 50s swing dress in beautiful blue floral on black printed cotton; ‘Dee Dee’ is the very essence of vintage glamour. An off-the-shoulder Bardot neckline embodies that 1950s retro style, with tiny gathers at the bust that draw the eye; so alluring and devastatingly feminine. An absolute classic, who can resist the timeless elegance of our full-skirted Noir ‘Dee Dee’ dress? An off-the-shoulder Bardot neckline, with dainty angled sleeves, this vintage dress possesses an ageless quality, perfect for all sorts of occasions. How do they get that glorious 1950s pinup silhouette? The secret is in the tailoring, taking inspiration from original vintage swing dresses and adding some clever details like high quality non-stretch cotton, an elasticated back panel and subtle padded cups to enhance and support the bust. Ain’t she sweet? Lola Lu is your new BFF. Sweet red gingham in an easy iron/crease free fabric, the perfect swing dress that will always look great. Oh, sweetheart! Dee Dee is everything you need in a vintage full circle dress; off-the-shoulder neckline, waist-flattering wide belt, classic angled sleeves and a shamelessly generous full circle skirt. Our ultra-cool collection of ‘Dixie Doll’ style vintage skirts are new to our kitsch range of unique retro clothing, all lovingly made in the UK. This super cute, vintage skirt is crafted from a luxurious Jules Crepe in true Red which will really turn heads….